His business model has been upended, profitability lies in tatters and the regulatory environment has turned against him. But billionaire Sunil Bharti Mittal, who controls India’s largest mobile company, has just signalled a $14.6 billion intention to fight to the finish. Bharti Airtel Ltd. reported a fiscal fourth-quarter loss this week in its Indian operations – its first in 15 years. Yet to write off Mittal as a loser in the great Indian data war of 2016-2020 may be a mistake. Mittal is agreeing to share control equally with Vodafone Plc in the merged tower business despite having a higher equity stake. The telecom tycoon is making his intention clear: He wants to monetize his real estate to invest in the battle against Reliance Jio Infocomm Ltd. If the expanded tower company is able to negotiate better rates with tenants, finding a buyer for, say, half of Airtel’s stake could easily add $3 billion to Mittal’s telecom war chest. Nothing else matters. Bharti Airtel’s wireless market share of 26% has it comfortably ahead of Jio at 15%. However, the problem is that Jio, backed by Mukesh Ambani, India’s richest man, added almost 9 million subscribers in February, compared with little more than a 4 million gain for Bharti. Every second person in the country who took a mobile broadband connection last quarter opted for Jio’s plans that offer unlimited voice calls and as much as 2 gigabytes of data per day. Before Jio’s September 2016 entry with an expensive $31 billion 4G network, data was a sideshow in India. The business model used to be about charging customers for voice conversations – and collecting money from smaller operators for terminating calls on their networks. Ambani killed the first avenue by offering lifetime free calls, and the regulator choked off the second. Jio’s stated goals of making Rs350 ($5.20) a month from an average user —and charging at least Rs50 per gigabyte of data —are red herrings to confuse competitors into thinking the price war will end relatively soon, as Elara Securities’ analyst Ravi Menon puts it. Mittal, struggling with average revenue per user of Rs116, isn’t falling for the ruse. What Ambani really wants is market dominance, which Menon translates as a revenue market share of 40 to 45% by the end of 2019. To get there, Jio could relentlessly undercut on price. Currently, only 20% of India’s mobile subscribers have broadband internet. But that could change if the early success of JioPhone — a 4G-enabled feature phone that Ambani is effectively giving away — is anything to go by. While the smartphone market in India is showing signs of saturation, JioPhone is being lapped up by bottom-of-the-pyramid customers excited to go online for the first time. To withstand Ambani’s triple play of carriage, content and commerce, Mittal will need to offer customers more than free Netflix. Given a net debt to Ebitda of more than 3 times, capital infusion into the network would need to come from equity. That’s why the tower merger, which will allow Bharti to cash in by selling a stake, is a good first step. Listing the promising Africa mobile business is another opportunity. It’s hard to say what the 2020 landscape may look like. 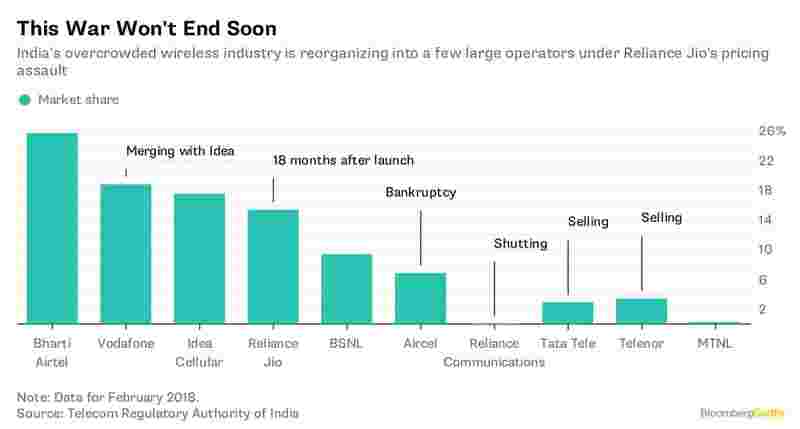 Assuming Jio and Bharti are close rivals that each have a substantial revenue market share, the prognosis must be bleak for Vodafone and billionaire Kumar Mangalam Birla. Currently ranked second and third by subscriber numbers, Vodafone’s India operations and Idea Cellular Ltd. are merging. Their strategy beyond marriage, however, is unclear. No wonder Idea’s shares have 12 sell ratings from analysts, versus six buy recommendations, while 22 analysts say Bharti is a buy, and only four advise offloading.